Today we’re talking about stocks. Before I get into that, I want to get into a couple reasons on why you should even be reading my post in the first place. I’ve been investing in the stock market since I was 18 years old and, I hate to say it, but I’m now 29, so I have had about 11 years of experience. The good thing about that is that I’ve experienced both bull and bear markets. A lot of people have been investing over the past five, six, seven years. They’ve only known a bull market that has lasted about nine years. Essentially people think that they’re geniuses. They’ve never taken a loss. It’s been pretty easy to be a genius for the past nine years. I remember the losses from 2007. I remember the losses from 2008, and I know how to compensate for that, how to adjust my portfolio accordingly. In terms of living through both those markets, I describe myself now as an aggressive investor. I do enjoy growth stocks, but, at the same time, I am somewhat risk averse. I’m the guy that’s going to look for doubles and triples. I’m not necessarily going to go for those home runs or Grand Slams, even though those have happened in the past, especially with tech stocks over the past couple of years. I’m not going to be chasing those gains. I like to look for medium-to-long term plays. Those are the plays that I’m going to be talking about today. Let’s start with number one. Now you may be thinking that this definitely isn’t the sexiest pick in the world, but I’ll tell you why I think it’s a great pick. Home Depot is the world’s largest retailer of home improvement goods, and they have about 2300 stores in the United States, Canada and Mexico. I’m familiar with Home Depot because I’m a real estate investor myself. I have three rental properties that received significant improvements, and they were built using most material from Home Depot. I have a lot of relationships with subcontractors and builders, and 90% of the time we end up buying stuff from Home Depot because it’s the best quality and it’s the cheapest. Pricing is cheap because of scale. They’re almost like a Wal-Mart where they can afford to negotiate prices down with all their vendors. The vendors are in their stores because they know that it is selling more volume, so they give their products at a lower price to Home Depot. Their main competitor is Lowe’s who in 2017 did about 68.5 billion dollars in sales. However, if we put it into comparison, Home Depot did about 100 billion in 2017. That’s a significant difference. I feel like Home Depot stock price is fairly valued because right now it’s at a 24.1 PE ratio. The nice thing is that they actually have increased their dividend year over year. Right now it sits at about 2%. 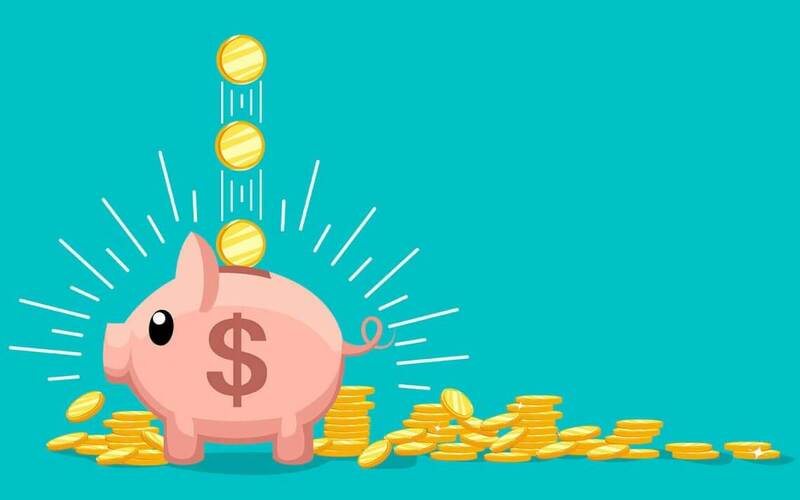 If you actually choose to use the DRIP program, which stands for dividend reinvestment program, you can actually build up your shareholdings in Home Depot pretty quickly. 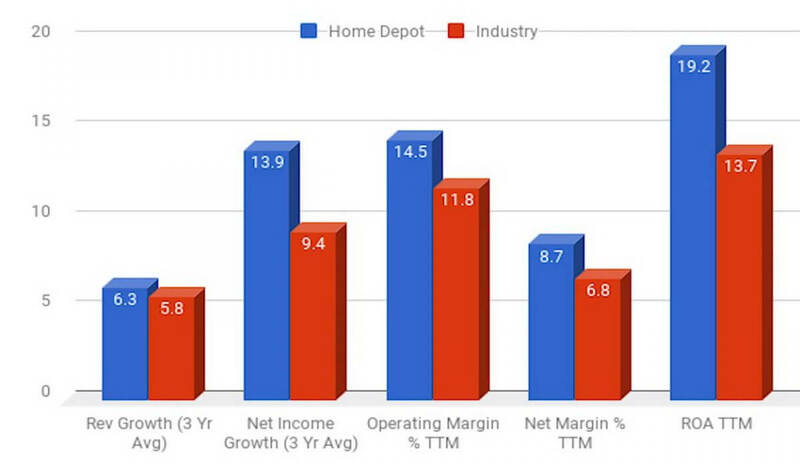 Home Depot has consistently surpassed the industry average and revenue growth, net income growth, operating margin, net income margin, and return on assets. Every year they’re beating out the competition pretty significantly. This keeps them an industry leader, but you also have to realize that since Home Depot is a market leader in a mature industry, it makes it hard for the company to find new growth opportunities. As I mentioned earlier when I started the analysis on Home Depot, this is not going to be your 20-30% gainer. It’s not going to be an explosive stock because it is an industry leader, and it’s been a mature industry leader for a number of years now. However, it’s going to be a solid single base hit or double at best, but it’s a great mid-to-long term hold for throughout 2018. Nvidia is a really exciting company. Many people are drawn to these tech companies that have a lot of potential in the future. The reason they’re so exciting is because they play in 4 really cool segments. The first segment is gaming. They improve graphics through their GPU-Z. Essentially what they do is they produce graphics cards for videogame platforms, desktop computers, and pretty much any other component that needs graphical processing. The reason this segment has exploded so much is because of eSports. There are now 350 plus million users in eSports. If you don’t know what eSports is, this is essentially videogame competitions. These are now digital athletes. However, in order to power those video games at the highest level and at the highest frame rates, they need good graphics cards, and this is where Nvidia comes into play. Number two is their professional virtualization. Essentially, professional virtualization is enabling companies to design and manufacture products efficiently, and to create highly realistically digital content. It makes more and more developers use VR and their content, which requires professional GPU-Z. The third business unit is data center. Nvidia supplies all the major cloud providers with its GPU-Z. In these high performance GP use enable thousands of artificial intelligence developers to rent computing resources by the hour, and they test their apps, models, and services on these virtual servers. Their fourth business segment is automotive. Believe it or not, Nvidia is actually involved with artificial intelligence for driverless cars. This could be a huge opportunity in the future. 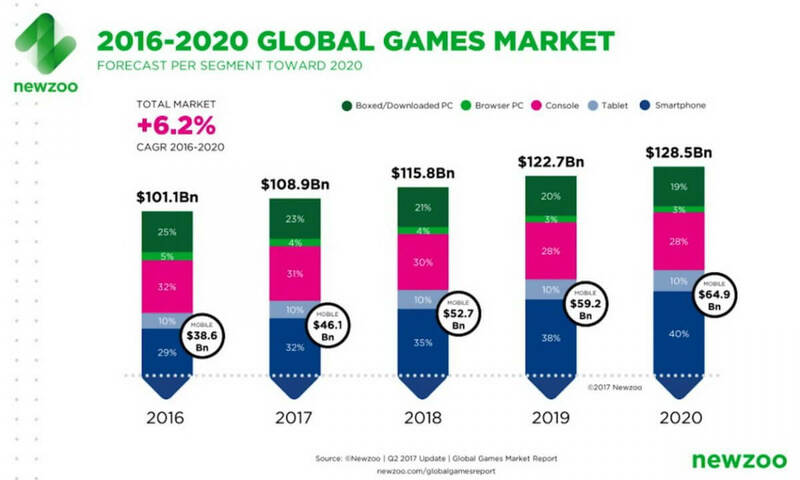 If you check out the graphic of the global game market tendencies, you can see that in 2016, the global games market was about 101 billion dollars, that is equal to sales of the entire Home Depot for 2017. However, from 2017 all the way to 2020, it’s growing from 101 billion dollars fast, and five years later, you’re almost at 130 billion dollars. This is a huge opportunity for Nvidia. Going back to self-driving cars, I really feel that self-driving cars are going to be the future. Nvidia already works with the major automotive companies such as Tesla, Audi, Mercedes Benz, and Toyota. They also work with Tier 1 suppliers like Bosch, and mapping companies like TomTom. They’re supplying many companies in the automotive space. Moreover, according to their CEO, they’re going to have huge revenues and several thousands of dollars per Robot taxi. I know that sounds like some futuristic stuff, but it’s a reality that we’re going to have to get used to. Let’s take a look at Nvidia’s fundamentals. Their income statement has pretty consistently grown over the last four or five years. Their balance sheet has had a little bit rockier road, but it is definitely still on the uptrend. Their cash flow statement has increased as well over the years. One of the biggest risks of owning Nvidia is that the landscape or the environment is always changing. Technology changes at the speed of light. However, it does take many years to develop their GPU-Z, so this could actually be somewhat of imbalance, or maybe even be a lag in technology versus what people actually want and need. That’s one of the biggest risks I see for Nvidia, but, overall, there is huge upside with artificial intelligence, self-driving cars, and visualization which we mentioned earlier. Ultimately, this is another one of my picks, going into the medium-to-long term hold for 2018. My third and final pick for 2018 is Microsoft. I truly believe in this stock because I work for one of the biggest resellers of Microsoft in the entire Midwest, if not the biggest reseller. We are a certified Gold Partner with a lot of their products. I actually work on the networking side, so I sell servers, data storage Azure, or things like that. This is a stock that I’m very familiar with. Microsoft always gets overshadowed by the other FANG stocks, that stand for Facebook, Amazon, Netflix and Google. They’ve seen a huge amount of growth over the past two years. They are also a great dividend champion, in my opinion. They pay a great dividend, and they’ve increased that year over year. 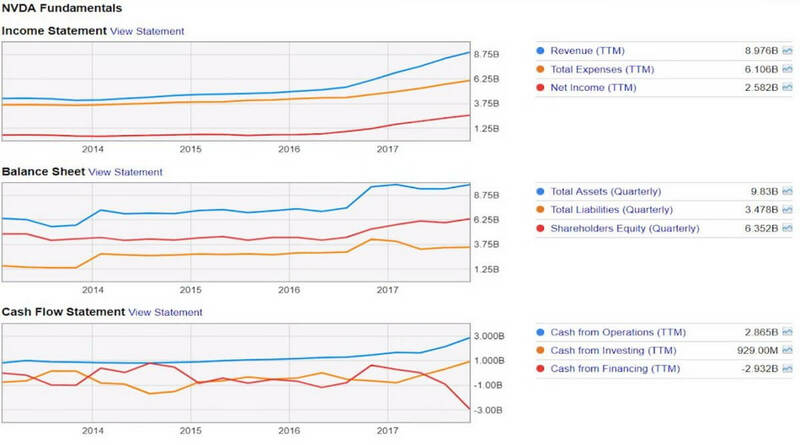 The reason I think that Microsoft still has more growth, and it’s a good dividend play as well because they’re flying high on their cloud growth. Let me point out something for you. In the Q4 earnings call, Satya Nadella, the CEO, mentioned that the company’s commercial cloud Annualized Revenue Run Rate (ARR), that stands for how much recurring revenue you have every year, exceeded 18.9 billion, that’s on course to surpass their target of 20 billion in commercial cloud ARR in fiscal 2018. Azure is Microsoft’s Virtual servers. If you have business and you want to put your business information on a server and don’t physically own, that is what Microsoft Azure provides. It’s similar to Google’s cloud services and Amazon’s Web Services. In Azure they have a strong growth catalyst. Azure revenue grew 97% year over year. 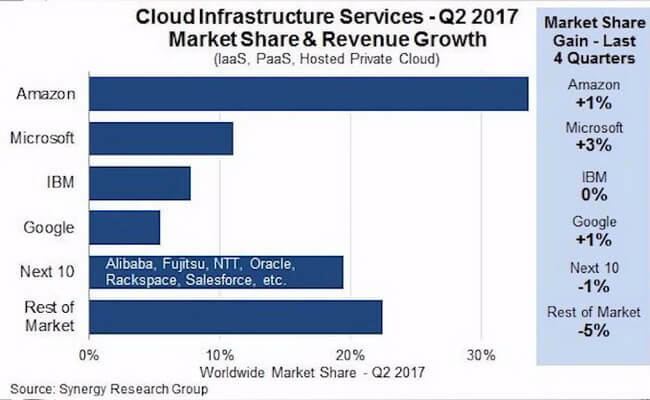 In Q4 2017 this put Microsoft as the second biggest cloud player. I believe it’s second to Amazon Web Services. Microsoft’s market share stood at 11% at the end of Q2 and Amazon Web Services is right around 34%. I’ve been on these sales calls for Microsoft. I know exactly how their reps are getting compensated. Their reps are getting compensated so much more for selling cloud services than on premise. On premise is actually when you install, for example, ERP software that helps run people’s businesses on their servers. Microsoft is compensating their sales reps so much to sell cloud services more than anything, so they’re really making a push towards the cloud which, I think, is the future. If we take a look at infographics, we will see Amazon leading with Microsoft right behind, then you IBM and Google, and then essentially the rest of the market. If you don’t understand Microsoft’s business model, they don’t only sell Windows, if that’s what you’re familiar with. They sell a huge enterprise resource planning software; they sell Azure which is what I sell. They also sell Office 365 which is essentially the cloud version of Microsoft Office. Ultimately, I think Microsoft is going to end up somewhere in the 100-dollar range for 2018 which is pretty significant growth. I think Microsoft will be a great medium-to-long term hold all throughout 2018. If that dividend keeps getting raised, and the stock price keeps going up, you definitely should hold onto that and use the DRIP program.